Awhile ago I sent out some test tubes and pipettes to my nieces and nephews. I said that I would be posting some experiments that you could do with them. Here is the first experiment. This is a fun way to start using your test tubes and pipets. To run this experiment place about 1mL of sodium bicarbonate (baking soda) in the bottom of a test tube. Now fill your pipette with 5% acetic acid (white vinegar) and squirt it into the test tube. Be prepared for this to overflow the test tube, it is part of the fun. Repeat the addition of acid until no more bubbling occurs. The first time I did this with my son he was about 22 months old. I asked him to put the tube by his face and asked if he could feel the fizzing. He then took to calling it fizzle fizzle and often asked for it by name. Try this again but instead of adding all of the baking soda at once place half of the soda in and then place a drop of food coloring in the test tube taking care to have it drop in the center of the baking soda. Then add the rest of the baking soda. After the second or third addition of vinegar the foam will turn the color of the dye much to the delight of the young scientist. This activity is not just for the youngest scientists. Because carbon dioxide is more dense than air the test tube will stay filled with carbon dioxide. This can then be poured over a match extinguishing the flame. This shows both the greater density of carbon dioxide and the need of oxygen during combustion. Another variation on the sodium bicarbonate acetic acid theme is to make rockets out of film canisters. Place some baking soda in the film canister next add some vinegar and quickly snap on the lid. Invert the canister so that the lid is on the table and wait. In a short time the canister will pop a few feet into the air. I've done this a few time with cub scouts and they love the excitement of not knowing when the rocket will launch. 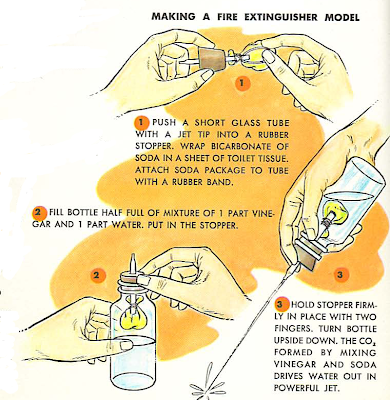 The last suggestion for baking soda and vinegar is a lab fire extinguisher. Some old fire extinguishers had an aqueous solution of baking soda and a small bottle of sulfuric acid in them. When the fire extinguisher was inverted the acid would react with the baking soda and produce carbon dioxide. The carbon dioxide would then force the water out and it could be used to extinguish the fire. 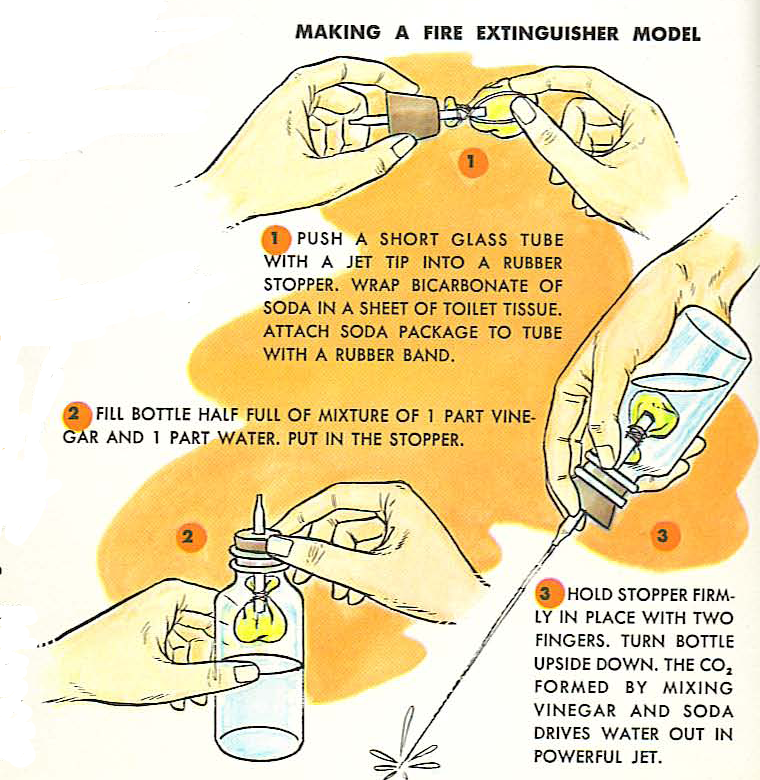 You can build your own lab fire extinguisher as shown in this illustration from the Golden Book of Chemistry.